My friends at the Goodwill San Antonio recently asked me to make a number of fall centerpieces using only items from the Goodwill. 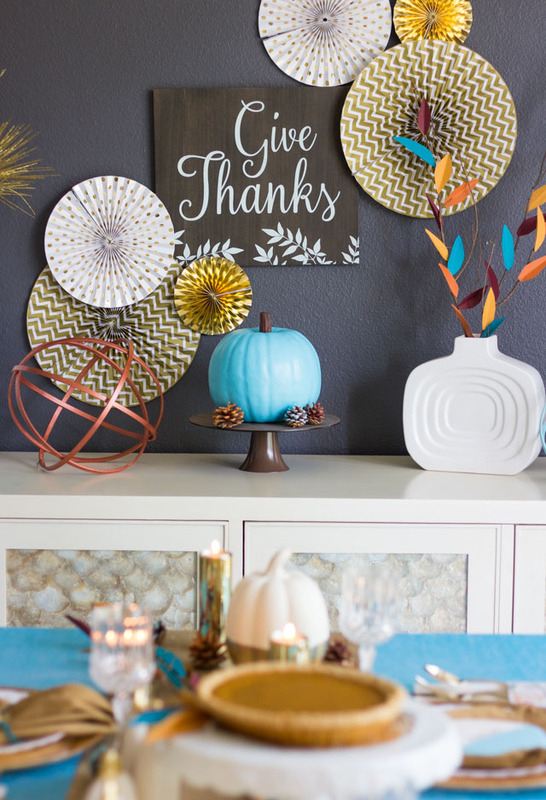 I loved the challenge and wanted to share the results with you to give you a little inspiration for your Thanksgiving table! 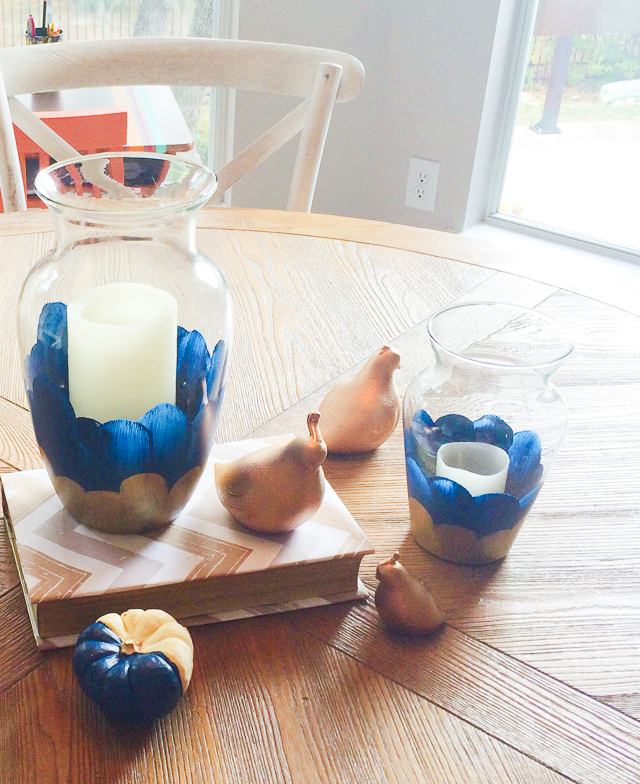 It’s amazing what you can do with $1 items from the thrift store and a little DIY touch. 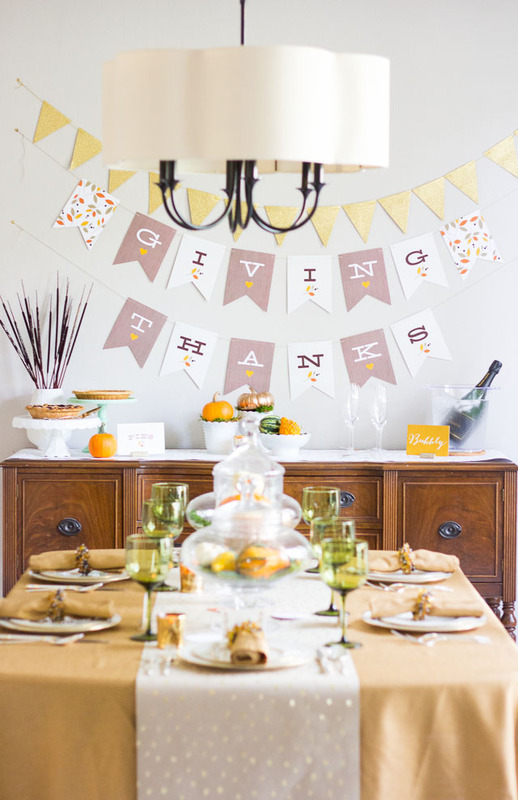 Read on for my 5 ideas for creating Thanksgiving table decor from Goodwill items! 1. 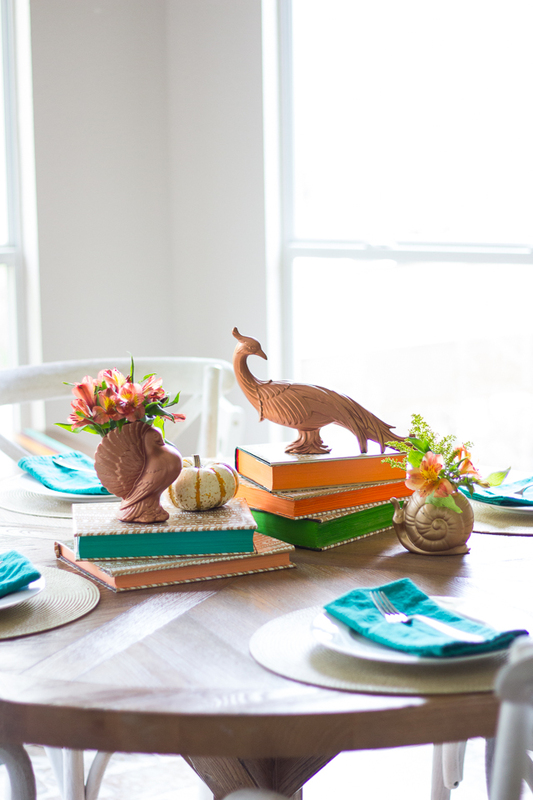 Figurines – Maybe the last thing you think of putting on your Thanksgiving table, but when painted a single color, mismatched figurines look beautiful together. 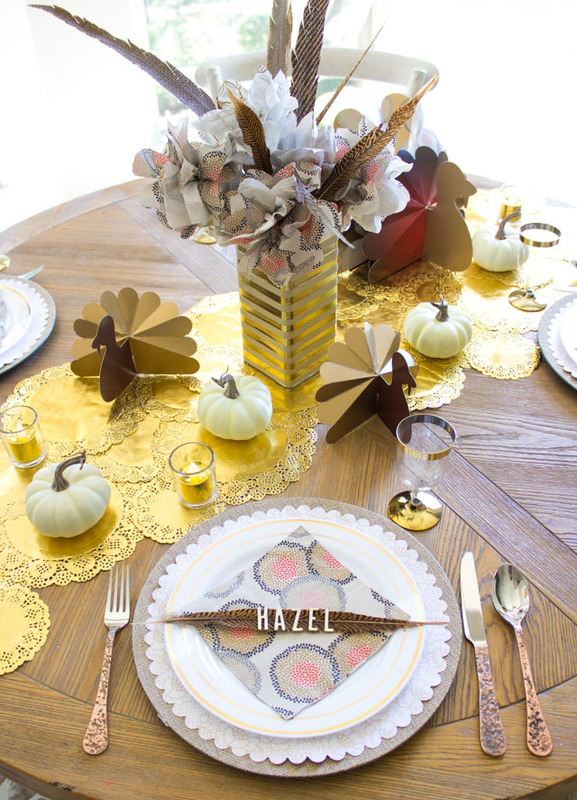 Metallics like gold and copper are especially pretty for fall. This copper spray paint is my favorite. 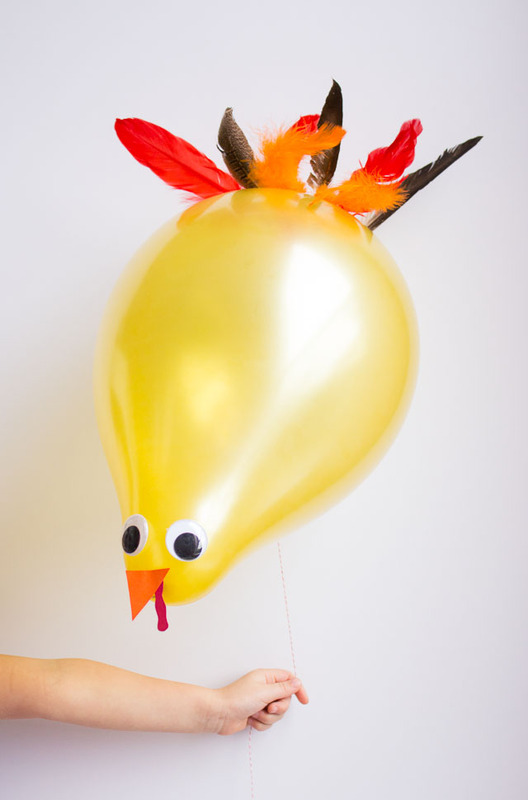 Look for interesting figurines like birds or fruit that would work well in a fall display. I found all of these for $1-$2 each. Many figurines I found at the thrift store were also tiny little vases that you could put fall leaves or flowers in like these above. 2. Books – Thrift stores are overflowing with hardcover books needing a new home. My Goodwill had shelves of them for 99 cents a piece! Well, they make great risers to help vary the height of your tabletop display. All you need to do is cover them with a sheet of pretty wrapping paper and paint the front edge of the pages with colorful craft paint! I looked for nice thick hardcover books in good condition. 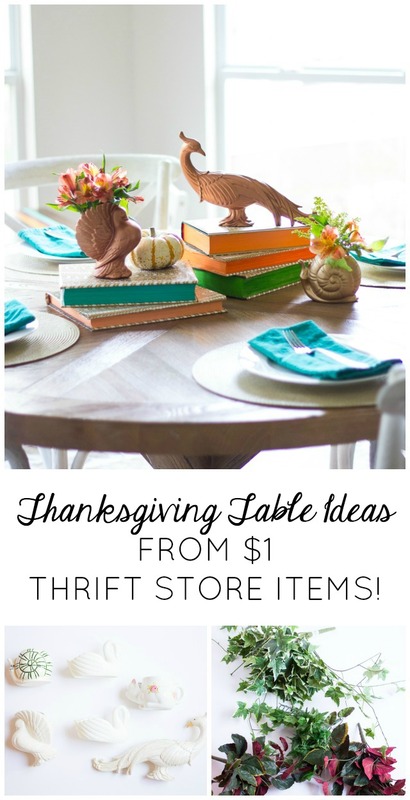 After Thanksgiving, these would make pretty additions to any vignettes you have on your mantel or bookshelf! 3. 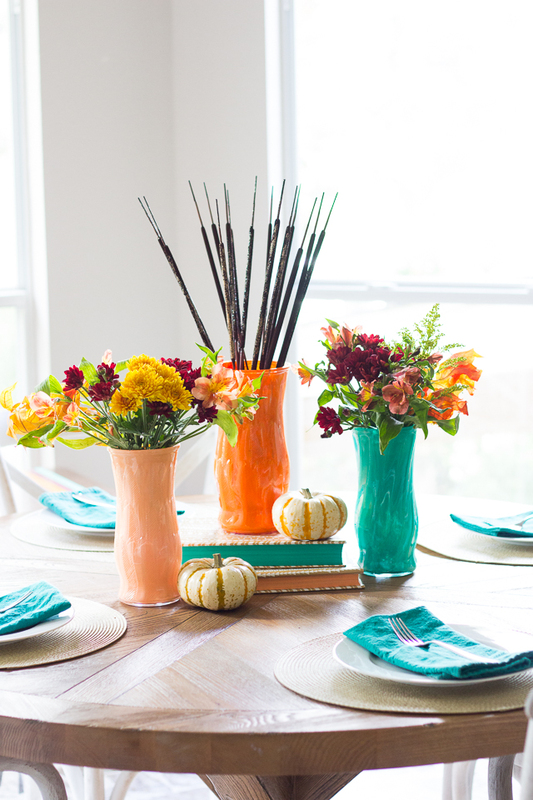 Florist Vases – One of my favorite tricks is to paint plain florist vases to give them a completely new look. Your local thrift store is bound to have an aisle of these glass vases in all shapes and sizes for $1 a piece. I love painting the inside of the vases for a smooth look on the outside like these above. My favorite paint to use for this is Martha Stewart Multi-Surface Craft Paints! You can also paint the outside for a pretty brushstroke effect like I did below. I turned these vases into holders for flameless candles. 4. 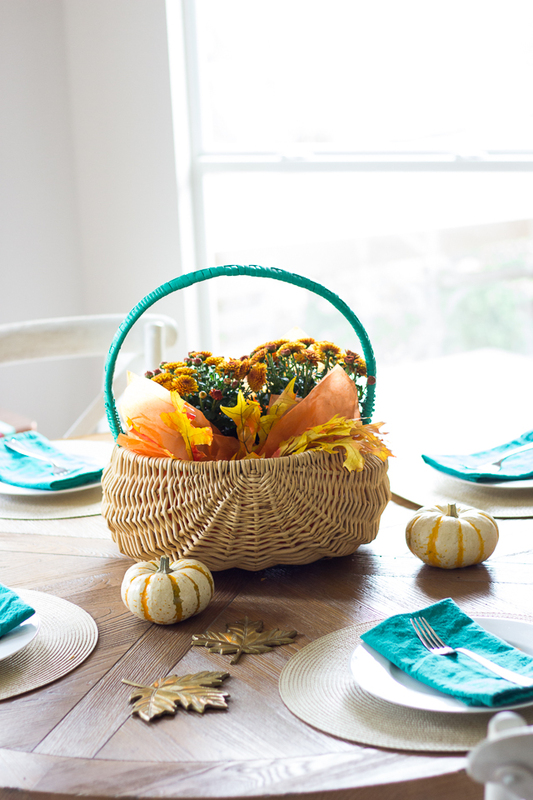 Baskets – Baskets add a great natural texture to your table. You can even paint them, like I did with the handle below for a fun pop of color. I filled this basket with fall mums, but you could also choose a low basket and fill it cornucopia style with fresh fruits, gourds, and greenery. 5. Artificial flowers – you can find artificial flowers and leaves at the thrift store for $1 a bunch. These dusty pieces turn instantly chic with a coat of metallic spray paint. One can of spray paint will cover three bunches of leaves the size of the one below. While their large surface area does take quite a bit of spray paint to cover, it is still less expensive than buying faux metallic foliage from the craft store. Also, don’t forget your figurines! My Goodwill had loads of these swans – originally in shades of pink and white. 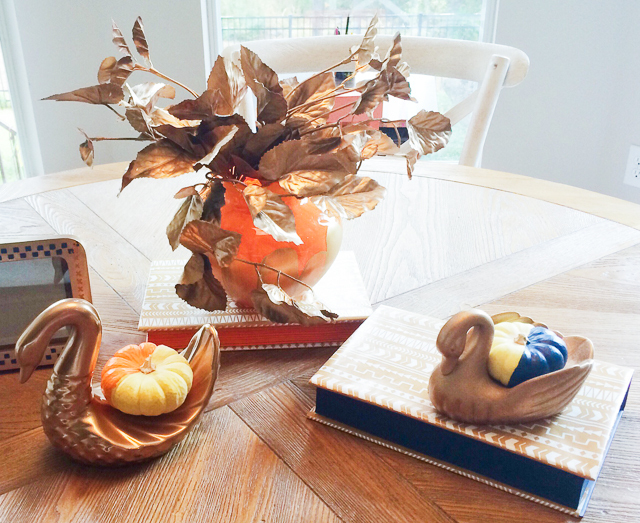 They look so pretty painted bronze and are the perfect size to hold a mini pumpkin! These are all amazing ideas!! And so practical, love it!